Pop-up is a roaring success for Holker! 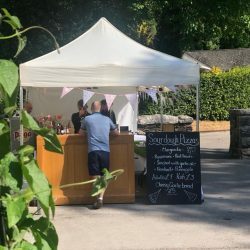 A new summer pop-up launched for July and August at the historic Holker Hall has proved a sell-out hit with both locals and tourists according to the event organisers. ‘Pop-up Pub & Pizza in the Courtyard’ is open every Saturday from 3pm until the end of August and with free entry visitors can expect good food, great ales and family fun! The alfresco afternoons have been so popular in fact, they’ve been close to selling out of pizza’s – don’t worry though, more can be cooked in the woodfired pizza oven! Jillian Rouse, Head of Visitor Services comments, “We’ve been delighted with the interest in this regular event – we’re keen to attract people to the Courtyard as it’s such a lovely setting for informal food and family events. You can come and sit, soak up the atmosphere, eat delicious pizza, try some of the great local ales on offer and while away a few hours with friends and family – it’s all very relaxed. Someone actually said it’s the best cheesy garlic bread in Cumbria!”. Try a visit to the Holker Pop-up Pub and Pizza in the Courtyard before it ends – freshly made woodfired pizza served straight from the oven including, Margarita, Pepperoni and Seafood, plus delicious cheesy garlic bread! Drinks and refreshments also served and fun for the kids with traditional games. Tours of the Kitchen Garden which are new for this year – Every Thursday at 2pm in July & August. A wonderful opportunity to join a knowledgeable Holker gardener for a tour of the Kitchen Gardens. Enjoy a behind the scenes visit to this private area. Free with garden tickets (limited numbers), please book at the Kiosk on the day of your visit. Thursday, 23rd August – NGS Open Day – Tour with Holker’s Head Gardener. A great opportunity to take a tour of the private Kitchen Garden with the Head Gardener, Glyn Sherratt. All money raised goes to the NGS. £15 per person. Tour starts at 11am. Pre-booking advisable. Plant Fair & Holker Food Market – Sunday 26th August. As well as the Plant Fair, enjoy the Holker Food Market and savour the scents and sample a variety of fresh, local and regional food and drink. Meet the artisan producers and get some fabulous recipe ideas to tickle your taste buds. From 10.30am, free entry and free parking. Dogs on leads welcome. For more information, visit the website at www.holker.co.uk or call 015395 58328. Visit the Holker Hall & Gardens this August – a fantastic day out for all the family. Free parking and free admission to the Courtyard Café, Food Hall and Gift Shop.